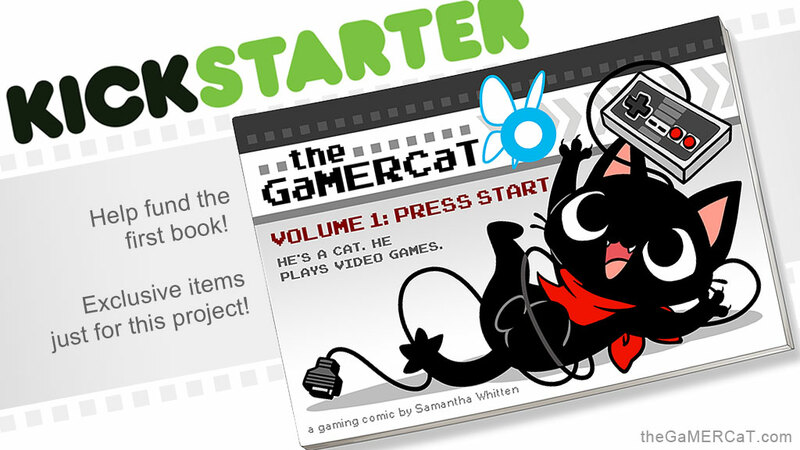 The GaMERCaT – Page 2 – He's a cat. He plays video games. Kickstarter for Volume 1 Book! It looks like I completely forgot to make a post about this here, but I’m currently running a Kickstarter to fund the printing of the first book of the comic! It will include the first 100 comics plus bonus content, and I’m also offering some exclusive Kickstarter-only items like pins and stickers, so please check it out if you’re interested! The Kickstarter ends on October 16th! A lot of you have been asking for more GaMERCaT shirts, and they’re finally here! I’ve partnered with Tapastic and Amazon to make new designs available, so check them out at the links below! They’re available in men’s, women’s and children’s sizes, and all designs are available on multiple shirt colors.